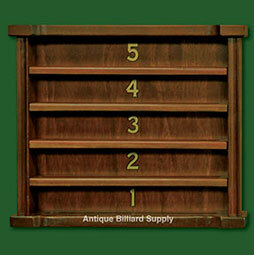 #6-20 Early Brunswick wall-mounted ball rack. Five-shelf model for use when space is limited. Only 22 inches wide, 19 inches tall. Completely restored with medium brown finish. Mahogany construction with gold leaf numbers on vertical rear panel.